After a couple of days of respite heavy winds are expected to return Wednesday to the California area plagued by a massive fire, potentially hindering the efforts of firefighters battling in an already dry climate. 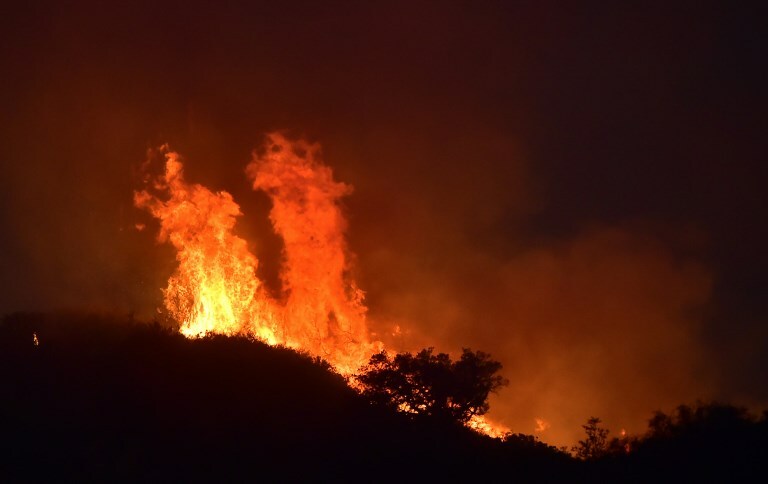 The fire has already destroyed at least 272,000 acres (110,000 hectares) - - nearly the size of the city of Los Angeles -- and is just 55 percent contained since it began December 4, according to the state's fire authority Cal Fire. The so-called Thomas fire is considered the second largest fire to hit the state since 1932. The National Weather Service issued a red alert from Wednesday evening into Thursday morning for "gusty winds and low relative humidity" in the affected area of Santa Barbara County. Firefighters took advantage of weaker winds on Monday and Tuesday to battle the voracious blaze, which has already destroyed more than 1,300 structures. Cal Fire pointed to the well-off city of Montecito as its area of greatest concern, after the fire on Saturday rained ash on the dry hills and million- dollar mansions of the area. Mark Brown, the Cal Fire operations section chief, said Tuesday was "a very productive day" but emphasized "we are not dropping our vigilance." "There's still risk out there," he said, noting the forecast winds. Only one fire has burned more California land than Thomas: the Cedar Fire of 2003, which swallowed some 273,244 acres. California wildfires: Why are so many listed as missing?